Pros: An unforgettable and unusual location, used to its full potential, adds so much more to the experience. Cons: Not the easiest Shakespeare play to access if you aren’t already aware of the story, and the seating arrangement sometimes left me straining to watch. A superb adaptation of what could have been a dry play, full of emotion that could be seen clearly in such an intimate setting. Just a week after seeing a Shakespeare comedy in the amazing location of a Protestant Church in the heart of Soho, I could not have guessed that that glorious building would be surpassed so soon as I made my way to Henry V. While last week’s church only boasted a history of around 150 years, Middle Temple Hall, part of the ancient legal quarters, dates back to the 16th century. Even walking from the tube station was an experience: I wandered through old cobbled streets between buildings that are still used for their original, legal purposes, as I sought out the hall itself. Once inside, the audience is seated on two sides, allowing for the performance to take place in between. I’m always in two minds about this configuration. On one hand you are in touching distance of the actors, but on the other, when scenes take place at both ends at once, it feels like watching a live tennis match: turn left, turn right, over and over. Aside from the layout of the seating, this incredible building is put to perfect use. As the lights went out, we all looked to the source of the noise outside, watching as the cast walked past the two arched doors between main hall and entrance, a procession of wounded soldiers that instantly set the scene. Later there would be even more incredible use of the balcony of this grand building, lit up to represent the battlefield. Whoever designed the lighting for that scene alone deserves full credit! Shakespeare’s Henry V is set around 1415 and the Battle of Agincourt. 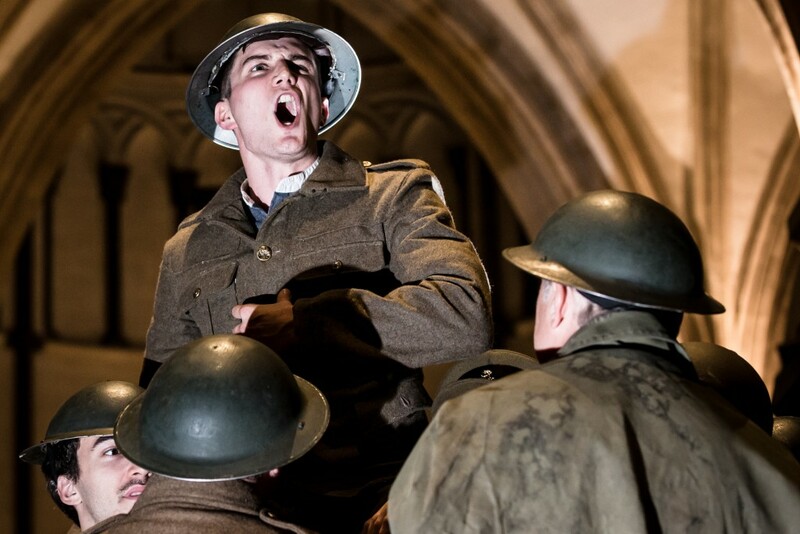 It is strange then that tonight the play begins in a military hospital in World War One. Those wounded soldiers we first witness are French and British troops, being brought back from the front line. While this is reasonably clear, it does helps that the excellent programme notes explain that it was not uncommon for wounded soldiers to put on performances, although maybe not normally Shakespeare, to pass the time as they recovered. This then is a play within a play, the soldiers performing Shakespeare. The poor acting of one soldier as he first forgets his lines and then reads them in such wooden fashion is a superb trick to demonstrate this concept. Soon though, you are taken fully into the Shakespeare play. So much so, in fact, that a few scenes left confusion as to whether they were part of Shakespeare’s play or part of the hospital scenes overlapping. 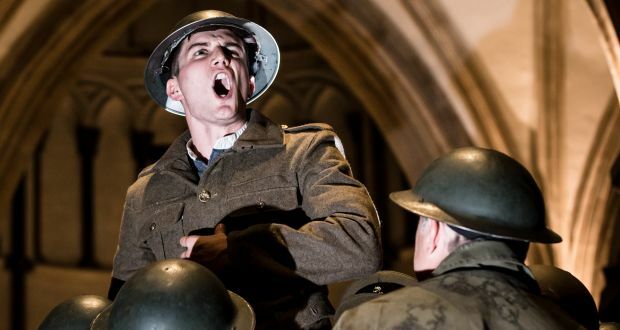 The emotion that this World War One setting gives is what makes Antic Disposition’s adaptation so gripping. The interplay between French and British, the wounded soldiers and their nurses, as they use Henry V to pass their time gives this quite dry play so much life. And the musical moments, adapted from the works of late 19th century poet A.E. Housman, fit effortlessly. The sound of the cast singing with such heart was enough to send a shiver down my spine, and when that happens, you know you are watching something special. Ultimately this is a play that works, not because of the original story itself. Instead, it’s the well constructed adaptation, the unusual location and the emotion that combine to turn this production into something very memorable.